Preparing you for your role as a Put a Squeeze on Diabetes ambassador. When you fundraise on behalf of Diabetes Canada and D-Camps, you are an extension of our representation in the community. It is helpful to familiarize yourself with diabetes and the work of Diabetes Canada and D-Camps so you can answer the questions you might receive. Below is some information to help you. If you encounter questions you can’t answer, please contact us at 1-800 BANTING (226-2464) and we will be happy to help you find the right response. Type 1 diabetes is a complex chronic disease with no known cure. Type 1 diabetes affects approximately 5 to 10 per cent of Canadians with diabetes, and occurs when the body is unable to produce insulin, a hormone that controls the level of glucose (sugar) in the blood. The cause of type 1 diabetes is unknown and it is not preventable. To survive, people with type 1 diabetes must take synthetic insulin (by multiple daily injections or through an insulin pump) to measure and adjusti their blood sugar levels. For someone without type 1 diabetes, the average blood glucose level is 5 and will automatically remain within a percentage point of that throughout the day. For a person with type 1 diabetes, these numbers will fluctuate constantly. Low blood sugar levels lead to sweating, nervousness, weakness, hunger, anxiety, blurred vision, dizziness, confusion and in extreme cases unconsciousness and death. High blood sugar levels lead to increased thirst, headaches, difficulty concentrating, frequent urination, fatigue and in extreme cases, diabetic ketoacidosis, a life-threatening condition caused by prolonged,elevated and untreated blood sugar levels. Type 1 diabetes is relatively rare, which can lead to feelings of isolation, loneliness and decreased self-esteem. 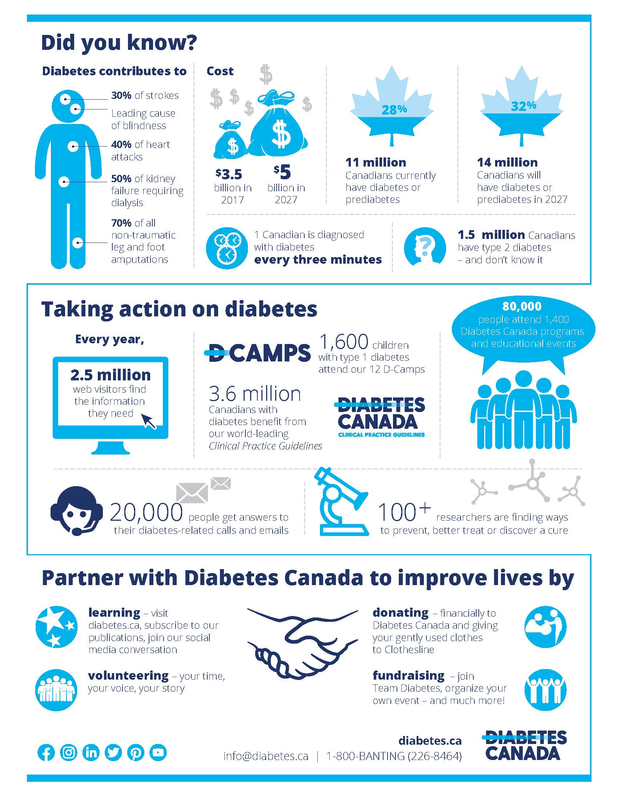 An estimated 300,000 Canadians live with type 1 diabetes, where roughly 30,000 are “camp age” kids. On average, there are only two children/youth with type 1 diabetes per school, nationally. there are things that affect blood sugar levels such as carbohydrates, insulin, physical activity, stress, emotions, puberty, illness, and weather.